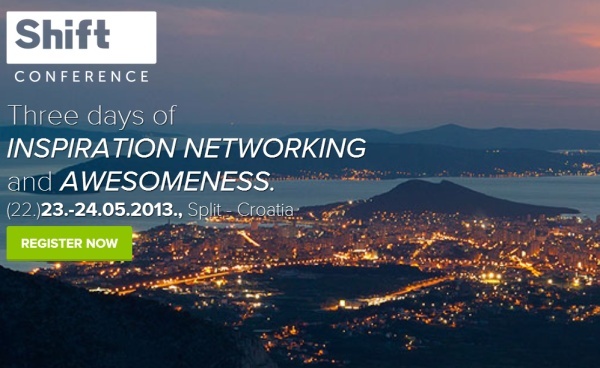 A couple of months ago, we announced that the Shift Conference would be held on May 23rd in Split, Croatia. Thanks to information provided to us by one of the event’s organizers, Ivan Burazin, we can now bring you the 32 teams which will be participating in the “Shift Challenge” for the $10,000 (7,700 euro) grand prize at the conference this week. The Shift Challenge is organized by the European Enterprise Network and is scheduled to be held on May 22nd, the day before the conference begins. We’re told that they had more than 130 applicants from 4 continents for the 32 spots in the event, so clearly there’s a substantial amount of international interest out there for this event. The prize money is provided by Splitska banka Societe Generale Group and other prizes will be provided by Nokia and SoftLayer. 1. Fieldpod – Croatia – A service which is designed to help workers track their activities in the field. Provides real-time statistics to help in improving the efficiency of the business. 2. Social Paragraph – Germany – Crowd-sourcing for translation. It allows users to upload the article and then ask contacts to help cover the cost of translation. One the article’s cost is covered, Social Paragraph hands the work off to their professional translators. 3. Analythink – Turkey – Service which follow the prices listed by your competitors in business. 4. Freelance Pro – Ghana – Allows freelance workers to build their online reputation. 5. Vidzor – Hungary – An interactive-video platform from the team at Pulilab. 7. 16Tags – Germany – Shows the user all their activities based on their hashtags. According to its AppStore description, users indicate their desired activity and the service offers suggestions for nearby related places and activities. 8. Zoomsquare – Austria – Matches people with homes. 9. Monitor Backlinks – Ireland – Although described as being Irish because of their investors, we know that this startup is Romanian in origin, as we’ve previously reported. It’s a service for managing your SEO backlinks. 10. Skiipi – Bulgaria – A skiing app which allows users to find course information, records, and challenges. A participant at the Balkan Venture Forum this week. 11. Sportly – Austria – A soon-to-be-released iOS and Android app for arranging sports activities and finding nearby partners. 12. Pubsonic – Serbia – A search engine for scientific literature. Another Balkan Venture Forum participant. 13. UseTogether – Romania – A community for people wishing to share their possessions, like books, CDs, electronics, board games, and more. 14. Puzzled.by – Romania – A site for asking questions and finding answers. Like Quora, Formspring, and Yahoo Answers. 15. REMIXER – Croatia – Designed to assist users in meeting new people. It’s a service which matches people on social networks, at conferences and other events, etc. 16. Baby Watch – Croatia – A device/app combination for monitoring the health of your unborn child. 17. Appointment Labs – Croatia – A cloud-based appointment manager. Competitor to Czech Reservio. 18. Party – Croatia – Offers a multi-user gaming platform for karaoke. The team behind this startup believes that current karaoke offerings are lacking and want to introduce a system which will allow users to “battle” against one another and sing in duets. Supposed to offer an improved, more social karaoke experience. 19. Sizem – Croatia – An app for finding appropriate bra sizes. 20. Klikeri – Croatia – An app designed for comparison shopping at malls. The customer will put his/her phone close to NFC tags on labels in stores and will receive information on product, price, location, data, and time. Can then view added bookmarks and share with friends. 21. BackWay – Croatia – iOS app which helps users to navigate places by allowing them to snap and tag photos at various locations. They’re then offered a distance and direction to the places they’ve visited. 22. Taggium – Bosnia and Hercegovina – Allows users to locate themselves in photos of crowds and to share these photos with their friends. 23. Amplio – Croatia – Simple voice recorder which allows users to send MP3 files as email attachments. 24. Ponude i Racuni (Now called Offerion) – Croatia – Allows users to make a variety of offers, bills, and reports for their business from their smartphones. 25. Mingle – Croatia – Allows users to create social networks for specific events in just a few minutes. 26. Manage HR – Croatia – Organizes data pertaining to recruitment process. It’s a system which allows employers to enter applicants into the database and view/alter their created profiles. Applicants can be rated by a set of criteria determined by the employer. Also allows for communication between the employer and applicant. Offers a multi-user interface, which means that every employee and representative of different sectors of the organization can be included in the application process. 27. Life Patch System – USA – Small, circular adhesive placed behind the user’s ear to monitor temperature in real-time. 28. LegalTie – Croatia – Software designed to improve connections between attorneys and clients. 29. AuThink – Croatia – System for helping autistic children. It offers autistic children a specialized series of tasks and allows teachers to create new ones and to monitor the child’s progress. Parents are also able to interact better with their children through this system. 30. Cropta – Croatia – Croatian Psychological Test Analysis. A service which allows employers to administer online tests for the purpose of evaluating candidates. 31. cQuest – Croatia – App which is an RPG with elements of LBS. Designed to promote culture and discovering local places. 32. Beaver Cleaner – Croatia – An app which helps people to local problems. They are able to take pictures of things they believe to be problems (like potholes) and then users can vote online as to whether the community agrees. Issues receiving enough votes will be directed to city officials to deal with.